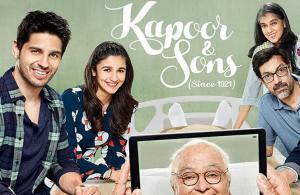 KAPOOR & SONS starts off with the 90 year old Dadu (Rishi Kapoor) ‘practicing’ death sequence at the dinner table. This is followed by a day in the life of the Kapoor family that consists of Harsh (Rajat Kapoor) and his wife Sarita (Ratna Pathak Shah) along with Dadu. The scene then shifts to the introduction of Harsh’s elder son Rahul Kapoor (Fawad Khan), who happens to be a hugely successful writer living in London and Harsh’s younger son Arjun Kapoor (Sidharth Malhotra), living in New Jersey, who happens to be a college dropout -turned-bartender, now ‘trying’ to be a writer. Right from the word go, he feels being treated as the black sheep of the family, because of which, he feels that his parents had always seen their ‘perfect son’ in Rahul and that they love him more than him. This is what creates a rift between the two brothers. One day, when both of them get a phone call informing them about the hospitalization of Dadu, they both rush to India (Coonoor to be specific). Despite their differences, they try to be good to each other for the sake of their family. One day, after an extremely tensed up argument, when Arjun attends a party to chill out, he accidentally meets the ‘chull-buli’ Tia Malik (Alia Bhatt), who is always full of life. Their friendship gradually blossoms into love. On the other hand, at the behest of an estate agent, Rahul (who is unaware of Arjun’s feelings for Tia) also meets up with Tia in order to buy her ancestral estate for his company. Tia gets infatuated by Rahul on a drunken night. Amidst all this, Dadu confesses about his last two wishes before he dies. While the first one is to be buried and not burnt after his death, the second wish is to have a happy family photograph, comprising of all the members. On the ‘D-Day’ of the family photograph, the can of worms is opened which leads to flaring of tempers, ego clashes and the family photo is session doesn’t happen. Post that, the family becomes furthermore distorted and disjointed.